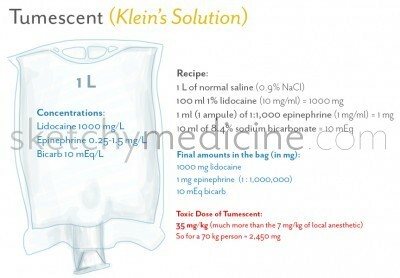 Tumescent solution is also called “Klein’s Solution” after the physician who characterized the recipe and the use of it. It’s called “tumescent” because it makes things tumescent, which is a fancy word for swollen. Tumescent is a dilute solution of lidocaine, epinephrine, and sodium bicarbonate that is injected in the subcutaneous tissue (fat). The epinephrine is the most important ingredient as it causes vasoconstriction, this means that the blood loss that could be a big problem for large procedures like burn surgery and liposuction becomes much less of a big deal. The other interesting thing is that since fat is relatively avascular compared to other tissues, the “safe amount” of tumescent is much higher than what is normally stated for injections of lidocaine or epinephrine. For example, it was reported by Klein that the toxic dose of lidocaine for tumescent solution is 35 mg/kg of body weight. 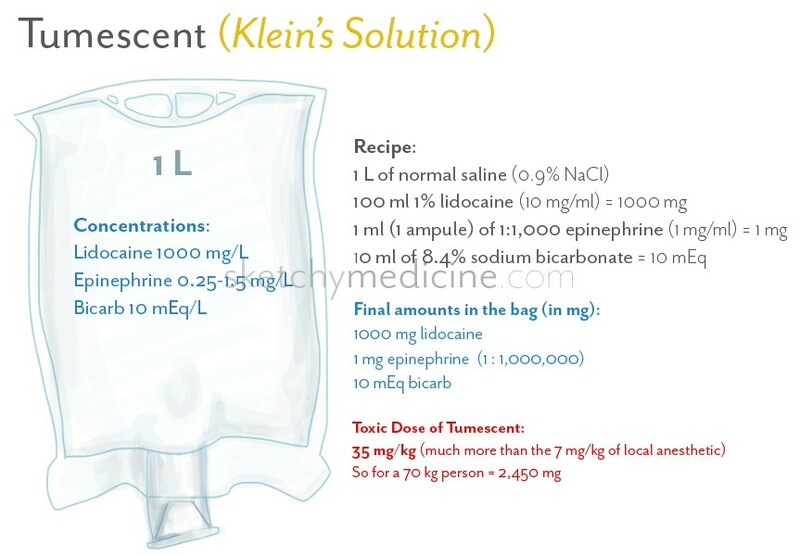 There are a few different recipes for tumescent anesthesia, the one presented in the doodle is the one first outlined by Klein, some use more or less lidocaine or epinephrine. Kucera IJ1, Lambert TJ, Klein JA, Watkins RG, Hoover JM, Kaye AD. Liposuction: contemporary issues for the anesthesiologist. J Clin Anesth. 2006, 18(5): 379-87. Klein JA. The tumescent technique. Anesthesia and modified liposuction technique. Dermatol Clin. 1990, 8(3): 425-37. Klein JA. Tumescent technique for local anesthesia improves safety in large-volume liposuction. Plast Reconstr Surg. 1993, 92: 1085-100. This entry was posted in Anesthesia, Derm, Drugs, Plastics and tagged Anesthesia, burn, cosmetic, pharmacology, skin by Ali. Bookmark the permalink.